To Teach Kids To Read And Write, Sometimes You Have To Get Creative : NPR Ed Across the U.S., school districts face low literacy rates among low-income and minority students. Here's how schools in Dallas, Baltimore and the Bronx are getting at the problem a little differently. Ximena Martinez, from Texas, thought this one was good: "Las naranjas son muy ricas." Translation: The oranges are very delicious. She's a native Spanish-speaker and preschooler at Kramer Elementary School in Dallas. Her teacher, Jorge Ruiz, always asks his young students to speak in complete sentences. That's because research shows that if children aren't reading proficiently by third grade, they're four times more likely to drop out of high school. "We've known for quite some time in education that there's an incredibly strong link between oral language development and future reading abilities" — no matter what language kids speak, says Alan Cohen. He's the brains behind this seemingly simple effort by the Dallas Independent School District to improve literacy by getting preschool through second-grade students to express themselves in full sentences. Cohen is the district's former assistant superintendent for early childhood education, a subject he has researched for a long time. 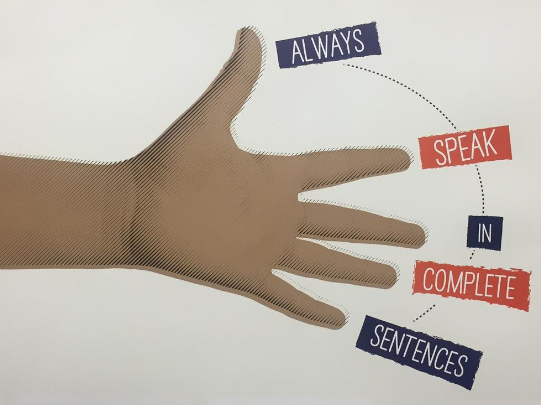 Posters encouraging students to speak in full sentences hang in the hallways at Kramer Elementary in Dallas. "If a teacher says, 'What color is this?' and holds up a red pen, and a child just says 'Red,' they've heard one word," says Cohen. "If the child says 'The color of that pen is red,' well, they have heard multiple words." That, he explains, means kids are hearing a greater number of words by the hundreds, or maybe thousands, each day of the year. Then, multiply that year, after year and the benefits are huge. Across the country, districts, schools and teachers are getting creative in the ways they teach students to read and write. They have to. Test scores continue to show how far behind low-income and minority students are in reading. This story represents just a sampling of cities (Dallas, Baltimore and New York) trying to think outside the box to improve literacy. Jorge Ruiz, the preschool teacher at Kramer Elementary in Dallas, says that at the beginning of the school year his 4- and 5-year-olds were shy and didn't always know how to finish a thought out loud. But they're now confident constructing three, four, even eight-word sentences. At some point in a child's school career, she hopefully transitions from learning to read to reading to learn. And many experts think the critical time for that is third grade. Reading to learn requires a level of comprehension that students struggle with in Baltimore City Schools. There, just 1 in 10 fourth-graders is reading proficiently. The district has a long road ahead to improve literacy, but it may have one small assist. For the past two years, every third-grader in Baltimore City Schools has received a copy of My Baltimore Book. It's about the size of a short novel and is supposed to give kids a reading resource connected to their everyday lives, says Becky Slogeris, the author. The idea is that the more familiar kids are with reading concepts, the more engaged they'll be and the deeper they'll learn. Slogeris also raised the money to give a copy to every student in third grade in the district, including Heather Tuttle's third grade class at Lake Montebello Elementary in northeast Baltimore. That's where students have their books out on their desks, open to a page with white and black circles mixed together, symbolizing diversity. Below that, there's an image of black dots on one side and white dots on the other, representing segregation. In this lesson, students learn the meaning of urban and suburban, how Baltimore's population tumbled starting in the 1960s with white flight and the loss of industrial jobs — all in the context of the Baltimore of today. Ms. Tuttle prompts a question: "Why do you think having a diverse neighborhood — or a diverse community — why do you think that's a positive? ... Or maybe you think it's a negative." And some kids aren't quite sure. One student responds, "I think living in a diverse neighborhood would be great because you can have friends there that might be from other countries and you can ask them about other cultures." "I don't want them to only be able to identify a definition; I want them to use it in conversation. And they do," says Ms. Tuttle. Nearly every student at Jordan L. Mott Junior High in the Bronx, in New York City, is behind in reading by at least a grade level. The school of 430 students faces a June deadline to turn around stubbornly low test scores. If it doesn't, it will have to close or come under state receivership. So this year, school leaders decided to focus on vocabulary. That's because of its well-documented importance in reading success and because recent assessments pinpointed it as a weakness among students at the school. "Words like predict, justify, evaluate, compare, contrast ..." can be difficult for kids at this stage, says Kimberly Tyson, a literacy consultant hired to encourage teachers here to think about vocabulary differently. It's in middle school that vocabulary gets more complex, and so Tyson tells teachers that kids need at least six exposures to a new word before it sinks in. Writing definitions in their own words can also help. Here are Tyson's list of 10 do's and don'ts for teaching vocabulary.